South Korean LPGA rookie Ko Jin-young would be the first to tell you she herself is quite surprised by her own quick start to her debut season. The 2016 Korea LPGA Player of the Year may just win the same award on the US tour this year, after picking up a victory and two other top-10 finishes in her first three tournaments as an official LPGA member. Ko earned her LPGA eligibility by winning the LPGA KEB Hana Bank Championship on home soil last October as a nonmember. And the 22-year-old has proven so far that she certainly has the game to compete on the biggest women's golf tour in the world. Ko is leading the LPGA in money, the Player of the Year points and the Rookie of the Year points. Ko is currently leading the tour in driving accuracy and greens in regulation too. After playing in three straight weeks in three different countries -- Australia, Thailand and Singapore -- Ko returned home this week to take a breather. In interviews held separately over the phone and via email, Ko said she couldn't have asked for a better start to her rookie season. "I never expected such great results," Ko said. "I think I've been able to play so well because of support from Korean fans on the road." Ko had been among the top players in the KLPGA and took her time last fall before deciding to take her talent to the US tour. She said at the time that she was hesitant in the beginning because she didn't feel she was ready. But once she joined the LPGA Tour, Ko hit the ground running. In February, she won her very first tournament, the ISPS Handa Women's Australian Open, to become the first LPGA player in 67 years to win in her official debut. She followed that up by tying for seventh at Honda LPGA Thailand and tying for sixth at HSBC Women's World Championship in Singapore. "I am trying to have as much fun as I can," Ko said. "I decided to move to the US tour because I didn't want to have any regrets, regardless of my performances on the field." Ko, world No. 18, said she is particularly enjoying competing against the world's best female golfers, and she has been feeding off South Korean fans at her three tournaments so far. "I've had so many Korean fans supporting me, and that has made me feel proud of being a Korean," Ko added. She said she worked hard on her short game over the winter and also tried to improve her conditioning so that she could withstand the rigors of traveling through the 33-tournament season. The first four tournaments of the year so far have been played outside the United States, and after a tour-wide break this week, the season will resume in Arizona with the Bank of Hope Founders Cup next week. It's the first of 16 straight events across the nation, with stops in California, Hawaii, Texas, Virginia, Michigan, Alabama, New Jersey, Arkansas and Ohio, among others. "Looking at the travel routes, I know it's definitely not going to be an easy stretch," Ko said. "I just have to try hard to stay in shape." 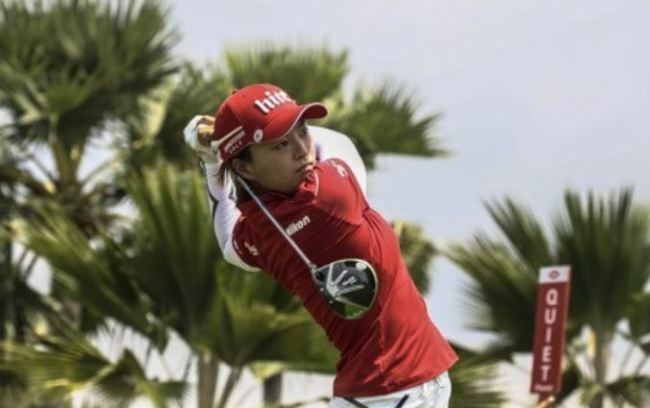 Ko said she has had great support from her veteran Australian caddie Dean Herden, who previously carried the bags for South Korean major champions like Shin Ji-yai, Ryu So-yeon, Kim Hyo-joo and Chun In-gee.